The dress had been bought for a good price, too bad, if only used once in a lifetime. You do not need income to a wedding dress who has just finished decoration in the closet now. The problem now, participated in a wedding dress that can be eaten. Wedding dress after the wedding would not be brought to the invitation, clubbing, or just a walk. Now, a young chef-cook in Colombia has two wedding dresses that everything can be eaten on the fashion show Colombiatex. Chef Juan Manuel Barrieto initially not interested in fashion, and may in fact not aware of fashion to eat, until someone gives him feedback. Barrieto response to input, then search for creative ideas and eventually succeeded in designing two wedding dresses that are very attractive because it can be eaten. So that was quoted from Genius Beauty, Friday (2/4/2011). In this mode to dress the eyes of many, but thanks to great work Barrieto can only fill the stomach, without reducing the visual quality of the dress. Yes, Juan Manuel Barrieto finally the wedding, so more sweet with the use of sugar coated rose petals for the bride to wear the dress designs. 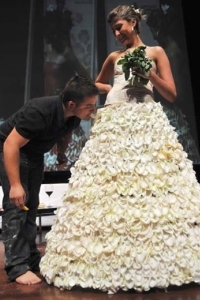 The dress consists of 2,000 lids are decorated with colorful rose petals and white champagne. Chief cook who now doubles so it was a fashion designer accessories do not forget a final touch, which consists of rings, bracelets, earrings and necklaces, all made of candy to set. A bouquet of flowers is made of special in his own dessert. The brilliant designer wedding dress was exhibited at the famous Colombian textile exhibition in the city of Medellín in late January.